Description: This 1771 opera buffa was Paisiello's first attempt at the comic genre known in Italian as metamelodramma, which made fun of the extravagances of singers, composers and impresarios and of the absurdities of the system behind the staging of Italian operas. 2 CDs. Italian-English libretto. 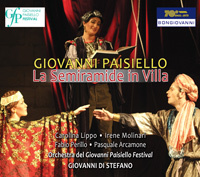 Carolina Lippo (soprano), Irene Molinari (mezzo), Fabio Perillo (tenor), Orchestra of the Giovanni Paisiello Festival; Giovanni Di Stefano.